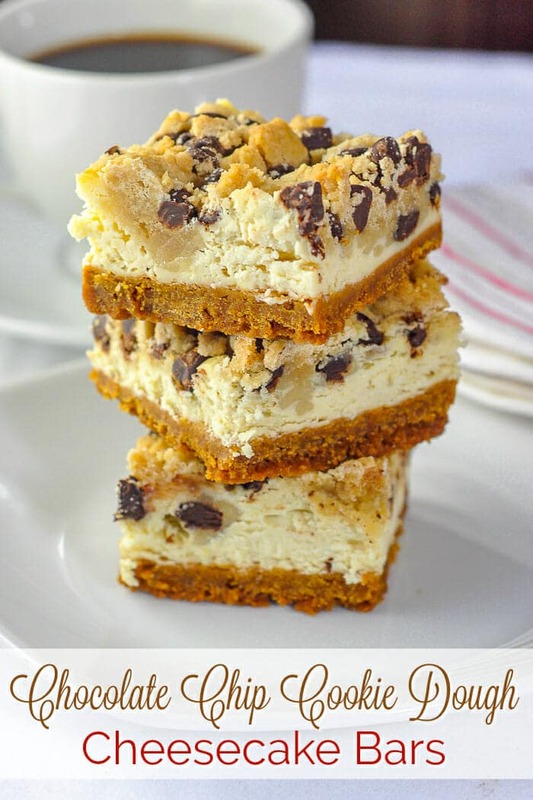 Chocolate Chip Cookie Dough Cheesecake Bars. The holy grail of cookie bars for cheesecake and cookie dough lovers and only 174 calories each! 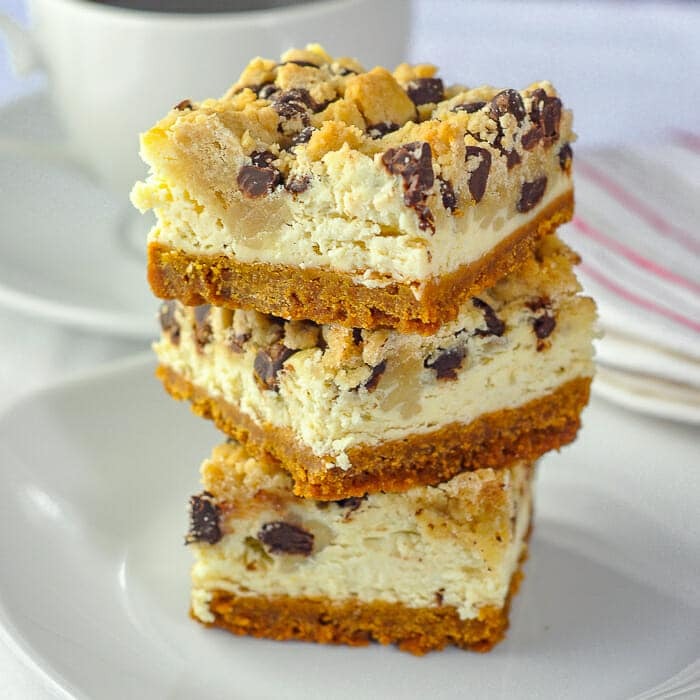 For many, these cookie dough cheesecake bars will be the holy grail of cookie bars; a perfect caloric storm of flavour with a buttery graham cracker crumb crust, a vanilla cheesecake centre and gobs of cookie dough on top. Because the cookie dough gets baked on top of the cheesecake, it just bakes to a light golden color on top and beneath retains a cookie dough texture. What an amazing combination in a single treat! They also freeze very well so you can take one or two out at a time to enjoy over several weeks…if they last that long. 2017 Update: This recipe has become one of our most popular cookie bars ever on Rock Recipes. 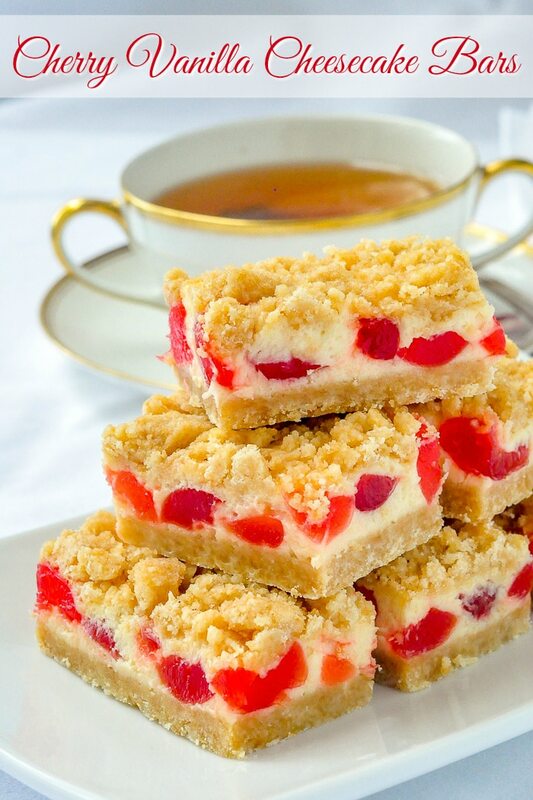 If you like this one you may also like our Cherry Vanilla Cheesecake Bars or our very popular Blueberry Lemon Cheesecake Dessert Bars . Like this Chocolate Chip Cookie Dough Cheesecake Bars recipe? 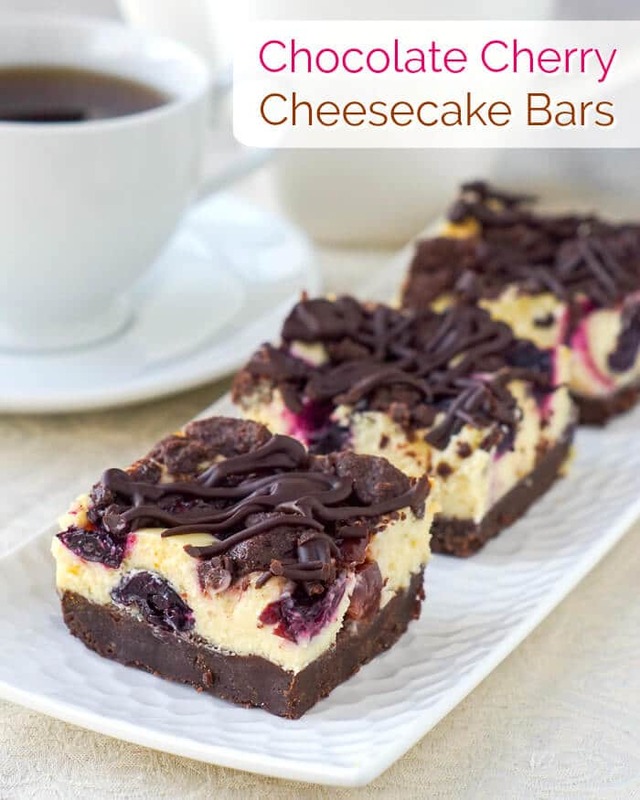 If you like this recipe, you may also like Chocolate Cherry Cheesecake Bars! Updated July 2018 to provide an option for metric measurements and provide nutritional information. These definitely would not last a week, let alone a day in our house! When a recipe calls for butter….do you use real butter or margarine? If real butter, salted or unsalted? HAVE to make these!! I never use anything but real butter. I use both salted and unsalted depending on the recipe but if using salted I omit any salt in the recipe. For frostings and things I always use unsalted. Made this for my daughter’s birthday, but as a cheesecake. I doubled the cheesecake portion, and baked in a 9 inch spring form pan for about an hour. Everyone raved about it! Thanks for the recipe. That’s a great idea Penny. I was thinking of doing it as a tart too. The recipe says 2 dozen. Actually, I was wondering the same thing as Maria because the recipe says “24 dozen”… Either way, however, these sound delicious! My mistake. The recipe originally said 2 dozen but in the update I had to add 24 as quantity to get the calorie and nutrition calculator to work properly. I just forgot to take out the word “dozen”. @4 dozen would have been some pretty tiny cookie bars! LOL! Barry, got your cook book for my birthday. The first thing that caught my eye was this recipe (I do love my desserts). I made them ASAP. Seriously, these should not even be legal. You managed to combine my 2 favourite desserts and the result is sooooooooo delicious!!!!! I ended up making a few batches and shared them with family and coworkers….everyone loves them. So amazing. THANK YOU!!!!!! And I’ve gone on to try many of the other recipes in your book, love them all. You, Sir, are awesome! I’m blushing. So glad you are enjoying the book. Look for Book number two this fall. Oh my I agree! I’ve made them several times as well with everyone raving and not a crumb left in sight, just amazing! Thanks for these thighs that don’t lie LOOL … I make and eat too many of your recipes to fit as well as I once did in my skinny jeans but I do it with a smile so I’m happy ,..
And I make these w a tbs of course sea salt in cookie dough and the sweet and salty is heaven! Hi, this recipe looks great and I was going to make it for Thanksgiving. Do you think I could double the recipe and make it in a 9×13 pan? (x9 inch pan recipes are multiplied by 1.5 for a 9×13 inch pan. is the white sugar icing sugar? Wow these look delicious! I can’t wait to make some. I just bought your cookie cookbook. Love it so much! just in time for Christmas. I want to make these wonderful looking bars. What kind of chocolate chips would you suggest? semi-sweet? milk? Whichever you like best. I use dark myself in everything 50% cocoa.